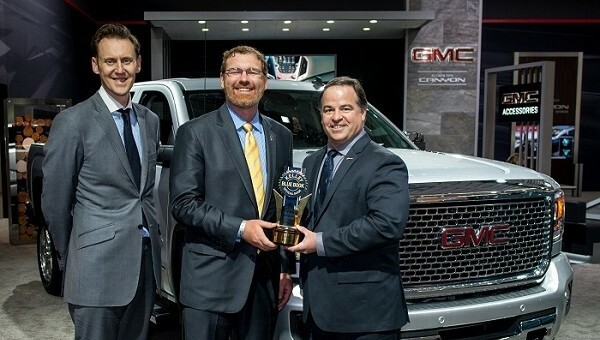 During the New York Auto Show earlier this month, GMC and its 2015 Canyon mid-size pickup and 2014 Acadia crossover earned themselves three awards from three different automotive industry publications. GMC took home the 2014 Kelley Blue Book Brand Image Award for Most Refined Brand. Brand Image Award winners are based on KBB’s new-car buyer perception data. The awards are intended to recognize automakers’ achievements in creating and maintaining brand attributes that grab the attention of the new-vehicle buying public. AutoTrader awarded the all-new 2015 GMC Canyon midsize pickup with the 2014 Must Test Drive distinction. The winner of this award was decided by determining the top 100 most popular vehicles on AutoTrader.com. The editorial team then narrowed the list down to about 80 vehicles total and voted. Nominees must have excelled in value, comfort, performance and style to win. The third and final award GMC was handed at the show was the 2014 Most Popular Large Crossover SUV from Edmunds. For this distinction, winners were determined by finding the three models in each of the 23 vehicle segments that had the highest total monthly car-shopper consideration in 2013. To Edmunds, ‘consideration’ means the number of unique visitors to the research and inventory pages on Edmunds.com desktop site for each new model. “A vehicular jack-of-all-trades, the 2014 GMC Acadia can handle it all. GMC’s family hauler is ideal for transporting your big brood to the lake or hauling a full load of provisions away from your local big-box store. In this highly competitive segment, the Acadia stands as one of the best picks,” a statement released by Edmunds said. This is always good new for GM, I’ve noticed over the years since 2007, GMC has really been pushing forward with the means to set a stronger reputation for itself, and it’s showing, can’t wait to trade in my 2011 2500 HD for the all new 2015/2016 Canyon by October of 2015.